Welcome to 2017! I can’t believe it’s January 1st already. Once they finally arrive the holidays always seem to pass so quickly, and now I only have one more day left before I have to go back to work. Yikes! That’s why it was so important for me to start 2017 right. I decided to stay home from the New Year’s Eve party last night due to a stomach ache, so I watched the ball drop in New York on CNN at 9 PM and then got ready for bed. I was asleep, wearing earplugs to avoid being awoken at midnight, by 10 PM. It was pretty glorious. After spending a lovely New Year’s Day at Disneyland last year I knew I wanted to do that again today, so I got up early and drove to Anaheim. 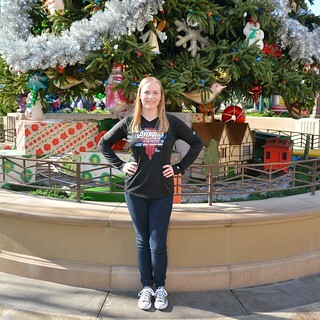 It was an appropriately chilly morning at Disneyland – the perfect way to ring in the new year. 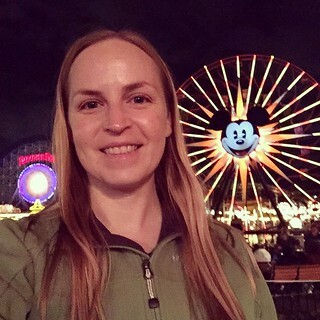 I’m going to savor sweatshirt weather at the parks for as long as possible because I know the warm weather will be here sooner than I’d like. In order to keep my daily calories in check I avoided the warming effects of the delicious Ghirardelli hot chocolate, though. I’m trying to start the new year healthy (although I ate quite a few peanut butter blondies this afternoon which didn’t help). Walking around Disneyland for three hours helped with that, luckily. I rode a few rides, bought a couple of pins, and basically enjoyed being there for the last time during the holiday season. I’m leaving for Orlando on Friday so I won’t be back to Disneyland until the middle of the month. I’m running the Star Wars Light Side 5K on Friday, January 13th (spooky!) so I’m looking forward to that. 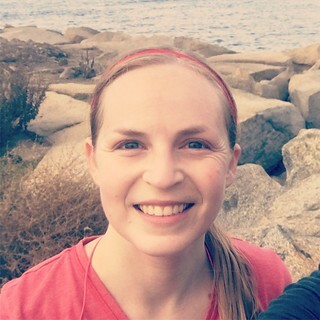 Speaking of which, I went for a 5-mile run tonight. I didn’t have a workout planned today, but after signing up for the Run the Year 2017 challenge yesterday I got a little paranoid about being idle on January 1st. Running in this chilly winter weather is ideal so I’m glad I went. I even ran into a friend and her family on the Seal Beach Pier! That was fun. Now it’s time for me to get ready for bed and prepare for my last day of this holiday break. It’s going to be a good one! After yesterday’s impassioned post you may have expected me to have a supremely productive day to make up for recent laziness. Unfortunately you’d be wrong, but I didn’t stay in bed all day either. As usual, the truth is somewhere in between. I intended to spend a few hours at Disneyland this morning, but I slept in (again) instead. I don’t consider it wasted time, though, since the holiday break is meant for catching up on sleep. After running a few errands I had an appointment at the DMV to renew my driver’s license. I had to do it in person this time around so that was annoying. Luckily with the appointment I was done in about ten minutes. After I left I realized that I might not get my new license before it expires (on my birthday), which could complicate my upcoming trip to Orlando. Having an expired driver’s license when I’m trying to fly back home to Los Angeles could cause a bit of a headache with TSA. Fortunately the solution is simply to bring my passport. Problem solved! When I got home from the DMV I tackled some New Year’s Eve preparations. Specifically, cookie baking! 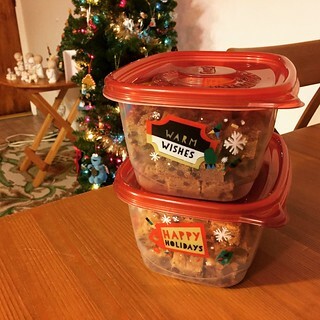 I promised to bring treats to a New Year’s Eve party and I didn’t want to leave making them until the last minute. So this afternoon I whipped up two different kinds of cookies – peanut butter blondies (because I still had a jar and a half of peanut butter left over from my Christmas cookies) and chocolate chip snickerdoodle bars (a holiday favorite). For the peanut butter blondies I started with this recipe from Averie Cooks and simply replaced the original mix-ins with a combination of semisweet chocolate and milk chocolate chips. (I had to sort through quite a few ancient bags of chocolate chips in my cabinet before finding some that weren’t expired! That’s a testament to my attempt to eat healthier over the last couple of years.) The jury is still out on these blondies so I’ll give you the verdict in another post. For the chocolate chip snickerdoodles, I got the idea from Pinterest, but I based them on my own amazing snickerdoodle bar recipe. I simply added some mini chocolate chips to the dough before I baked them. I’ll have to ask my friends what they think about them because I’m not immediately a fan. I can’t believe I’m going to say this, but I think the chocolate chips may have ruined the snickerdoodles! At this point I wish I hadn’t tampered with such a perfect recipe, but I’ll wait to pass final judgement until I get a few more opinions on New Year’s Eve. Only two more days left in 2016! Time to recap my 2015 resolutions before 2016 arrives! Happy New Year’s Eve, everyone! I’m going to count this one as a win even though it required little to no effort on my part. After getting hurt during the Disney World Half Marathon in January I decided to postpone my full marathon attempt for another year. It took me almost two months of rest to recover and get back to running again, but it was worth it. 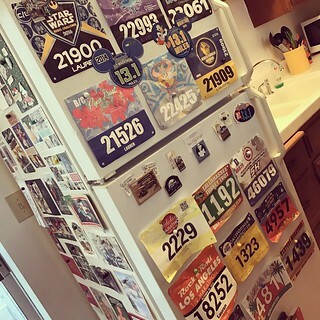 I’m glad I didn’t commit to marathon training this year because it allowed me to participate in quite a whole bunch of fall races that I otherwise would have had to skip. (I’m working on another post about that. My fall race schedule was insane!) Luckily I’ve been healthy for a majority of the year, and as of right now I am eagerly anticipating signing up for the Walt Disney World Marathon in January 2017. It will be the day before my 38th birthday so it seems like the perfect time to tackle such an ambitious feat. Registration opens in April and I’m nervous, but excited too! I’ve already put my marathon training plan on my calendar (purchased in Alaska this summer) that I’ll hang on the wall in my cubicle in 2016. It’s going to be a crazy year! If you’d asked me about this one halfway through the year I would have called it a win, but after that I started slipping back into old habits. Earlier this year I was turning off the television when I started getting ready for bed, but work/life/running stress caused me to go back to watching mindless TV at night. I know it has a negative impact on my sleep quality, but I just like the noise. With this in mind I want to try using a radio app like Pandora or iHeartRadio with a sleep timer on it instead. Also, I want to go back to turning off the television when I start getting ready for bed in favor of listening to podcasts or radio instead. I put blue light filters on my laptop and iPads at the beginning of the year because I was worried that my evening screen time was detrimental to my sleep, and I think it did help. However, I know that turning off all of the visual stimulation at night will be even more beneficial. Let’s just hope I can stick with it this time! An unequivocal win! When I went to Hawaii in June there was no way I was going to leave without donning a bathing suit and swimming in the Pacific Ocean. I wasn’t exactly looking forward to it since I’d put on a few pounds while I was recovering from my knee injury in the spring, but I still packed a bikini (newly purchased, of course, to replace the old suits I hadn’t worn in years) in my suitcase and I was determined to wear it. Not just to fulfill some silly New Year’s resolution, but also to prove that how I perceive my body won’t stop me from having as much fun as possible. I want to get the most out of life, no matter what the number on the scale happens to be at any given time. That doesn’t mean that I don’t want to be healthy (and slim, if I’m honest), but that I refuse to allow my weight or my measurements to dictate my happiness. I’m 36 years old and finally starting to make this distinction! I still have a long way to go, but wearing a bikini this summer in Maui was the first step. And what better place than the incredible beachfront mansion with a private pool where my friends and I stayed? That’s a vacation I’ll not soon forget. I’m not quite sure which category to put this one in. It’s a win in the sense that there are only a couple of major events from 2015 that I haven’t written about yet, but the “timely manner” part of the resolution points towards failure instead. I still haven’t posted about my amazing trip to Alaska! (Hopefully I can get that done before I have to go back to work on Monday. It’s going to take a lot of effort on my part to not squander what remains of my free time during this holiday break.) Looking back, 2015 was an unbelievable year for me (which is obvious looking at my photo albums from races, vacations, and holidays), but I haven’t done it justice in writing. It’s a shame. Luckily January is historically my most productive month as far as blogging is concerned, so maybe I’ll be caught up on my recaps before 2016 is too old. I can’t promise that I’ll be any more prompt with my documentation of my life in the coming year, but as always, I’ll certainly try. This last resolution is definitely a win, but to a lesser extent than I original planned. There were a few obstacles that prevented me from adding more color to my “states visited” map in 2015. First of all, I only travelled to DC for work once this year. I wanted to take a side trip to Connecticut, Rhode Island, and Vermont when I was on the East Coast, but I just didn’t have the time required for such a venture during my business trip in July. I did have the opportunity to take a quick jaunt (more like a three-hour drive with all the traffic) to New Jersey on the last day of that trip, but it wasn’t quite what I’d hoped it would be. It was still progress, though. Also, I was supposed to meet my family in Oregon in May, but fluid work obligations made that impossible. Maybe I’ll be able to visit California’s neighbor to the north sometime in 2016. On a positive note, the crowning glory of 2015 was our family vacation to Alaska in August. Denali National Park is such a breathtaking place and I loved every minute that we got to spend there. It was an absolutely incredible experience. More on that when I finally get around to writing a post about the trip. So as of the end of this year I’ve visited 35 of 50 states. Not bad when you think about it, but I still have 30% of the country to go. It’s a good thing I already have plans for 2016!